Make the Outdoors a breeze with the Signal. With all of its unique survival features including the fire starting ferro rod, emergency whistle and diamond coated sharpener for maintaining your blades. Be ready for the expected (and unexpected) with everything you need to strive in the outdoors right at your side. All locking features: All locking features mean that every tool and knife on the body of the handle, with the exception of the plier head, will lock into place. The all locking design enables the user to operate individual tools safely and effectively. By locking them into place when fully open, the user can put pressure on the implement while safely completing the job, before manually unlocking the tool to stow it away. 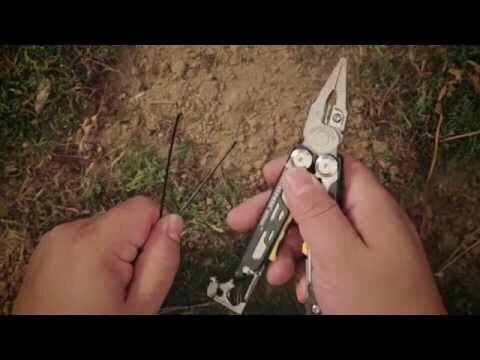 Replaceable pocket clip: A removable clip which allows the user to wear their multi-tool attached to a pocket or belt loop without the use of a sheath. By removing the clip, the user is able to easily carry their tool in a sheath if preferred. We take extraordinary measures so your Leatherman product will give you many years of dependable service. If it doesn't, we will gladly repair or replace it, at our discretion, with one of equal or greater value under our 25-year guarantee for tools. This warranty does not cover abuse, alteration, theft, loss, or unauthorized and/or unreasonable use of your Leatherman product. This warranty does not cover sheaths, accessories, imprinting, colour finishes, cleaning, or sharpening.